Packaging and presentation, although not everything (there’s taste to think about)- at the same time- is everything. In this case there’s chocolate pudding. 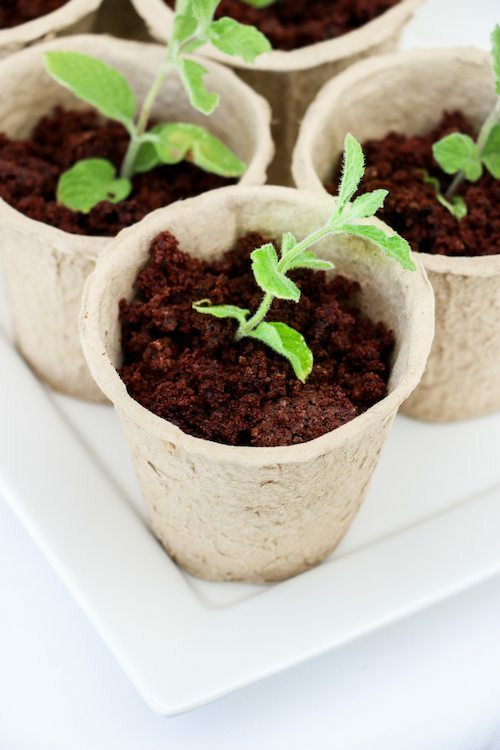 But take that chocolate pudding, place the glass of pudding into a brand new paper potting cup (I bought a package of these at a dollar store) and pop in a little sprig of mint, and voila! Normal chocolate pudding is transformed to fit with your Peter Rabbit garden theme, straight from Mr McGregor’s Garden. It’s simple for you and your guests will ‘ohh’ and ‘ahh’ about it. Sift together the sugar, cornstarch, and cocoa so there are no lumps into a mixer with a whisk attachment. In a bowl, stir together the cream, milk and vanilla. Turn the mixer to low, and pour in a slow steady stream all the liquid mixture into the dry mixture. Let the mixer whisk together until there are no lumps and is smooth. Pour the mixture into a medium sized saucepan and place over medium heat. Bring the mixture to a boil, constantly stirring so it doesn't don't burn or curl, as this'll leave you with ugly gloopy bits. Once it starts to thicken, add in the chocolate melt pieces, and stir until combined. Remove from the stove and stir in the butter. Let it begin to cool, then split the pudding between small glasses (make sure you don't fill to the top). Place in the fridge for about 1 hour, by which point it'll be cool and set. Meanwhile, place the cookies in a large sandwich bag and use a rolling pin to crush the cookies. Before you serve, sprinkle the crushed cookies over the top and press in a sprig of mint into each glass.